This paper is based on our contribution to the recent ACSA Fall conference posing the question of the autonomous and the contingent object. 1 We argue that this problem should begin by examining the theoretical paradigms underlying the opposition between the two concepts. In this paper we argue that it is a binary that falls within a list of other philosophical binary-problems. As Bill Hillier explains, “it is no surprise that philosophers have been fascinated by architecture, since architecture is an actual-world application of philosophy. But if architecture had an overarching theory that addresses these binaries it would be as though it had solved all problems in philosophy at once.” 2 The aim in architecture is to see them not as formulas or problems to be solved, but as research questions, opening up possibilities, whether we are in a theoretical or design mode. Our suggestion is that the autonomous and the contingent object carry the deeper question of who authors a work, a philosophical problem that takes its most intensified form in the Renaissance. Is knowledge and architectural authorship provided from outside or is it actively invented from within? More analytically, this question translates to: what is the source of the architect’s design ideas? What is the origin and what is the structure of the architect’s knowledge? How does authorship work? Who is the author of a work? In the first part of the paper we explore these questions by looking at the logical paradoxes inherent in the autonomous-contingent question, and attempt to provide a reconciliation between the two opposing concepts by examining three artifacts: Venice and two authored works which Venice gave rise to: Calvino’s Invisible Cities, and Le Corbusier’s Venice Hospital. The second part of the paper brings the Venice project and a design studio in the context of the “Spatial Design, Architecture, Cities” MSc i course (The Bartlett School of Architecture, UCL) as a way of addressing the autonomous-contingent problem. We argue that the autonomous and the contingent object carry the deeper question of “who authors a work,” a philosophical problem that takes intensified form in the Renaissance with the emergence of the Albertian model of design. What is the Origin of Design Ideas? If we support the autonomous object, we accept that ideas originate within the architect’s mind and operations internal to the discipline. If on the other hand, we believe that architecture is contingent to external factors, such as socio-economic conditions, evolution, historical influences, or even chance then it cannot be aided by the discipline or the designer. None of these positions seems to give a convincing account of the source of architectural ideas on their own. For Mark Gelernter, "if a theory can explain the role of the creative author in the generation of form, then it cannot explain how individuals seem to fall under the coercive influence of a prevailing style or a predominant ideology. 3 And if a theory accounts "for how architects attend the idiosyncrasies of context, it does not explain why they often generate versions of familiar forms throughout history for many different functions and contexts. 4 We can of course use one, or both the autonomous and the contingent object, but how can we avoid pursuing a narrow conception of design, particularly when the complexities of architecture demand rich, rather than shallow positions? Viewed from the perspective of the humanistic idea of architectural authorship, the idea of architecture as authored and autonomous object is the subject of the artistic imaginative processes of inventing. In contrast, the view of buildings and cities as authorless evolutionary processes is at the core of scientific or technological processes of taking in existing external information as guidance to design. The paradox has resulted in opposing world-views in design and educational theory, in which architecture is caught in the divide between the Arts and Humanities on the one hand, and the Sciences on the other. Design-research approaches have recently emerged (such as the design-PhD programme at the Bartlett School of Architecture), approaching design as research with an inter-disciplinary emphasis. However, the dichotomy still compartmentalises architecture and education into humanities-based and science-based research in many educational programmes around the world, each seen as being intrinsically different from the other. We argue that none of these two positions gives a convincing account of the source of architectural ideas that is powerful enough to claim social and political agency for the discipline. Having discussed the subject-object problem and the way in which it ties theories of design to theories of knowledge, we move to the humanistic idea of modern authorship. We suggest that this idea forms a variation on these themes, subjecting architecture to another crucial dualism, which establishes two things: first, the superior status of architectural design to that of building craft and more generally to inherited, collective, non-authored and tacit systems of spatial production; second, the superior status of the design original to that of variances to which the original might be subjected otherwise. For Mario Carpo, with Alberti, the design of the building became the original, and the building its identical copy.6 Design might have a fluid state but for Alberti, when revisions stop, they should stop for good and forever. Our argument is that the Albertian model has deeper and wider repercussions than this. It sets the superior status of architectural design to buildings and cities as found, because they are mosaics of accidents, adaptations, adjustments, additions, subtractions, revisions and other errors, most significantly by not having an author. The problem of designed and emergent architectures entails the danger of another duality, with the binaries in the last architecture Biennale in mind. Rem Koolhaas’ 2014 Biennale exhibition (The Elements) posed architecture as assemblage of elements based on market forces that mindlessly operate over and above architectural intention. This view also marked his approach in his book Delirious New York reading the city as self-organizing grid that maximizes programmatic potential. 8 Focusing on how architecture is produced on a systemic scale, The Elements suggests that we need to understand architecture as assemblage. Assemblages are bottom up and blind to the eventual outcome of design. In contrast, the Albertian model of architecture is top-down, clear in its intention but blind to evolutionary process. Koolhaas’ exhibition drew attention to the gap between buildings that are architecturally conceived and those that are dispersed to multiple points of production. From the interaction of planning codes with urban plots and infrastructures to informal urbanization there is a growing gap between the artistic aspirations of architects and the systemic operation of architecture as it happens on the ground. In the 1970s Manfredo Tafuri claimed that capitalism stripped architecture of its ideological purpose. Today the split between the architectural avant-garde, land values and profit has turned architecture to “form without utopia.” 9 But if architecture has social significance, how can we address the separation between mindful buildings and mindless production? We will now discuss the three artifacts as the means of exploring these questions. We chose to analyse Venice for the following reasons: Venice is the result of the intersection between organic urban growth and conscious architectural intent manifested in the medieval fabric, the monuments and urban spaces in the city. It was also the centre of Vitruvian studies, decisively opening up to the Renaissance during which the humanistic idea of architectural authorship developed in the early sixteenth century. As such, Venice can illuminate the interaction between architecture – seen as the "autonomous project" - and its socio-economic aspects – or the contingencies of context - including the origin of the relationship between the two. As to the Venice Hospital and Calvino’s Invisible Cities, these are greatly influenced by Venice, and thus, can help to explain the origin of creative ideas, whether these are ideas that are created in the mind or ‘discovered’ in buildings and cities as ‘found’. Analysing Venice’s urban networks, we will argue that they capture a pattern of evolution from an archipelago to an urban complex. As the city annexed new lands, local requirements such as the need for dual access from water and land led to a network of urban squares and global scale effects. The modularity and interconnectivity of this network are the characteristics that have informed Invisible Cities and Le Corbusier’s Venice project. The analysis of Venice’s street networki shows that the squares are all linked by a property known in graph theory as “betweeness” (and in space syntax as “choice”) capturing the paths that are frequently crossed when moving from one street to all others.ii This characteristic is also observed in the combined street and canal network in Venice, suggesting that the squares are nodes in the intersection between the two systems (Fig. 1). This pattern captures an evolutionary pattern, since early times, as the churches and squares were the social nuclei of parish islands, semi-autonomous community centres, which contained a market and were serviced through their proximity to water. Left: Choice (3000 radius) network of street system. Right: Street-canal system. The two networks intersect in Venice’s squares. The squares also facilitated water collection through cisterns and channels. The continuous network of through routes indicates that bridges were built so as to link the squares with each other producing a network of multiple interconnecting centralities. Another key characteristic of the squares is that they belong to a combinatorial syntax of elements: (square-church-cistern-canal-bridge-stepped access), leading to the emergence of a recognisable order devoid of preconception. Moving to the analysis of the Hospital (Fig. 2), the analysis of the building using the same method shows that an analogical relationship between the building and the network structure of Venice is at work based on a modular scheme, and on networks of routes (which Le Corbusier called calle in an analogy with Venice’s streets) intersecting in the square areas at the centre of the Unité de battise (described by Le Corbusier as campiello in reference to the squares of Venice). In response to the question of the source of architectural form, this is a clear case in which the architect has retrieved the non-designed architecture of Venice (an urban system) and creatively embedded it in a new designed reality (a complex building). The source of the Hospital’s form is neither inside nor outside the creative faculties of the designer, neither autonomous not contingent, but in the interaction between the mind and the world whose logic it retrieves and innovatively changes to produce new patterns. Left: Axial analysis of permeability. Right: Visibility. The two networks intersect on the square areas of the Hospital (in an analogical relationship with the networks of Venice). Moving to Calvino, the structure of the book is often discussed as a diamond shape. 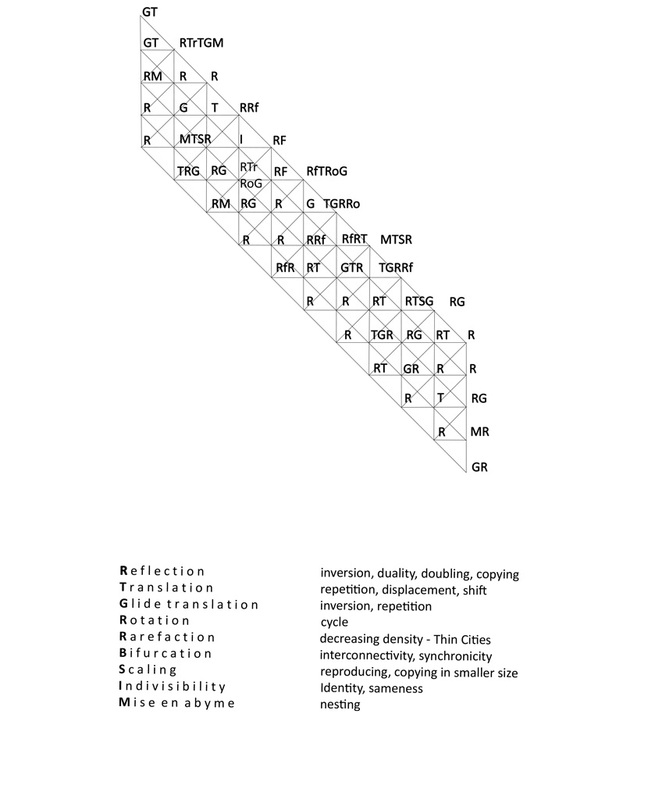 12 Previous analysis of the individual texts it consists of, shows that each text evokes conceptual relationships that express variations of the four symmetries in the tessellation (reflection, translation glide, reflection and rotation). 13 Plotting these transformations on the diamond shape captures the interplay between algorithm and literature, integrating combinatorial possibility with conscious intention (Fig. 3). The networked structure of contents of Calvino's Invisible Cities with the ‘operations' of transformation superimposed. All three artefacts are modular. All three consist of local-scale rules that produce modular and combinatorial patterns at the larger scale, casting light on the emergent and generative logic of bottom-up architectures. The morphological affinities between the three works bring along two main ideas: one is “relatedness,” that is, that architecture is about elements simultaneously entering into relationships with other elements, which our minds read and translate creatively; the second is that there are alternative and intersecting types of authorship that interact and influence one another, as the diagram in Figure 4 illustrates. Taking Venice as the main subject of the illustration, the horizontal axis plots variance of artefacts based on whether they are built or un-built (or virtual), while the vertical axis locates variations of designed and non-designed (or found) artefacts. The three squares in the diagram capture differentiation of scale to include buildings, building complexes and cities. Schematic representation of architectural production and built structures, according to typology of authorship (designed/non-designed) and materialisation (virtual/built). Works by eponymous architects in Venice, such as Palladio, Sansovino, Codussi, Scamozzi, are found on the right top corner of the diagram representing individual authorship that led to the production of built and authored designs. Venice is located on the bottom right corner, as a city, that largely speaking, was not the outcome of a singular design but emerged from evolutionary collective authorship. The Venice Hospital is located on the top left side of the figure by virtue of being a designed building complex that was not materialised. 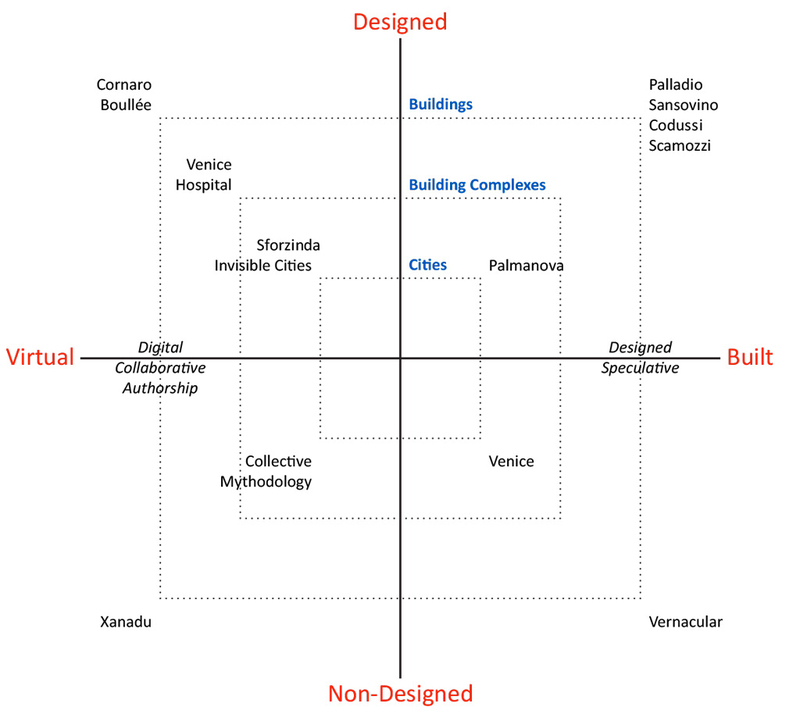 Sforzinda by Filarete, Invisible Cities by Calvino and other fantastic creations fall into the same quadrant with Venice Hospital, being characterised by ‘design’ intent, but having not been implemented. In contrast, the ideal Renaissance city of Palmanova occupies the opposite quadrant having been realised as a military planned city for the Venetian Republic in the late Renaissance. Finally, hybrid cases such as speculative architecture fall onto the right side of the (x) axis, designed by architects but lacking individuality and intentionality of the architectural kind. Similarly, digital designs conceived in a digital environment as algorithmic models through collaborative authorship (and remaining virtual informational models) belong to the left side of this axis. The example of Invisible Cities shows the generative effect of preconceiving the general structure of the work (in the form of the diamond shape), but releasing enormous amount of potentiality that trains the readers’ imagination. The combinatorial aesthetics of Calvino’s Invisible Cities is neither top-down or bottom-up, but combine intentional design with rules that are bottom-up and systemic in nature, encouraging the readers to construct their own invisible cities, and training their imagination. The three examples demonstrate that ideas travel from the external world of artefacts to the mind and to the world again through creative transformation. As to the autonomous and the contingent question, this is a matter of dynamic interaction of the bottom-up evolutionary recombinant logic of the mindless with the top-down logic of the mindful at different degrees of actuality, virtuality, and presence. 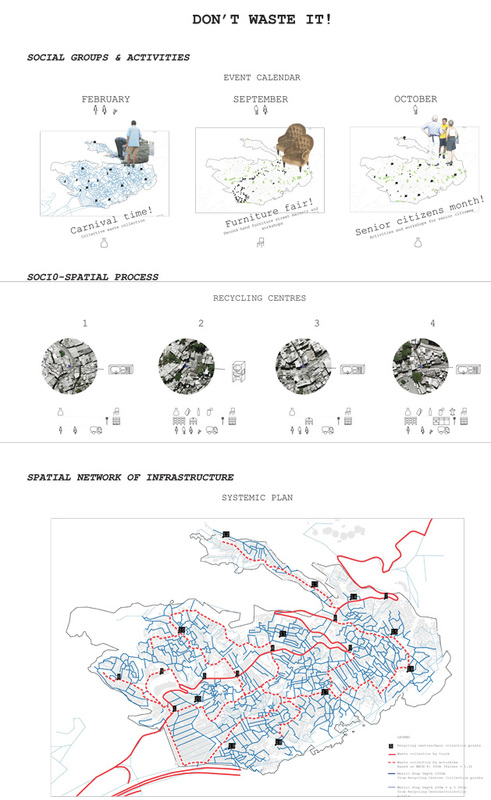 Having established the theoretical premise of the discussion we move to the example of a design studio that explores how this model can inform design practice.The studio travelled to Rio de Janeiro to explore an educational approach in the context of the long history of informal settlements in the city. 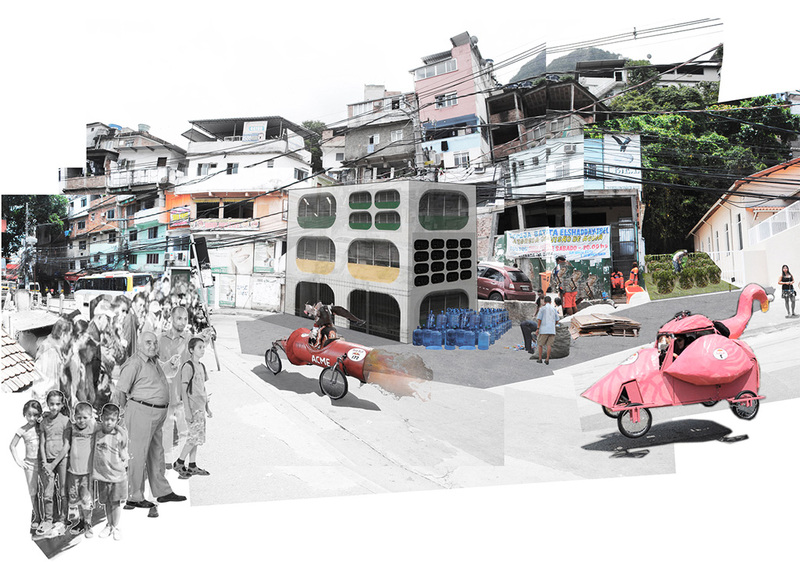 Located in Rocinha, one of Rio de Janeiro’s informal settlements, the studio had the general purpose of overcoming polarizations between the “designed” and the “found,” the “built” and the “unbuilt,” the analysis of found architectures and the design of new structures. 16 Drawing from Venice as an example of a city that grew out of a collection of semi-autonomous communities, the specific purpose of the design was to understandthe ways in which communities have in an autonomous and resourceful way created their own settlements. - The idea of negotiation between diverse types of authors, from architects, users and social groups to socio-spatial infrastructures. The idea of the interaction between found architectures and designed architectures discovering patterns in built structures through analysis, and creating new patterns through design propositions. - The idea of avoiding linguistic models which tend to convert fuzzy problems about the city into simple definitions, failing to capture complexity. For example, by comparing urban space to the human body, certain elements of the city have been considered as pathological. As a result, they were either ignored or considered to be in need of replacement. - The idea of generating knowledge about the city through the non-discursive techniques of mapping and drawing (using space syntax analysis, GIS mapping and field work). - The idea of enriching the knowledge generated by these non-discursive techniques with discursive methods based on theories and critical discussions. - The idea that in organically grown systems (such as informal settlements) individual agency ‘thinks’ and acts locally, but collective action produces larger structures over time. - The idea that there are design outcomes that accommodate adaptation as time-based process. - The idea that in order to re-imagine the city creatively we need to understand the relationship between transformations that work bottom-up in a systemic way and the creative mind that acts top-down in a designedly fashion. Instead of producing fixed outcomes such as buildings, or configuring open spaces by physical means, students developed designs that worked as social, economic and environmental infrastructures. These ranged from appropriating the cable car to service the residents of Rocinha (Figs. 5, 6), to devising waste management networks to reduce environmental risks and boost the cultural identity of the community (Figs. 7, 8); from do-it-yourself water infrastructure (Fig. 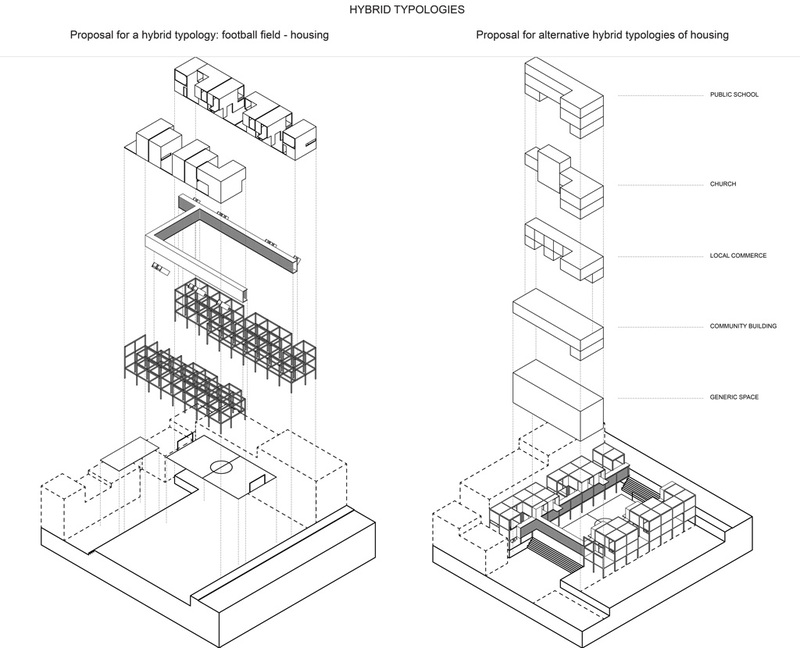 9) to inventing the hybrid typology of football - housing in order to improve safety and housing conditions (Fig. 10). This hybrid typology consists of two types that are found in the settlement, in the sense of urban voids where children play football and houses that oversee these fields serving a supervisory role. Here the new typology is invented out of two found ones in a mindful process. The combination of analytical and design explorations was based on the interaction between the two kinds of knowledge avoiding any hierarchical bias in their relationship. On the contrary,analytical and design ideas were intertwined through feedback loops linking mappings that generate various kinds of evidence with intuitive desires. Analysis and design propositions were each altered by outcomes that emerged from both sides in the design process. Street network analysis or volumetric analysis for example, was adapted to investigate properties that were not previously explored, such as the steepness of streets affecting senior residents in Rocinha and transportation. Similarly, design ideas were adjusted to knowledge emerging from street network analysis as a way to interrogate design intentions, and identify the most advantageous urban locations. Moving between analytical knowledge, theoretical speculation, and different models of authorship, students developed design approaches that worked as alternatives to the inherited top-down models of immutable interventions. Active forms from the individual infrastructure to the collective and the spatial network. Project by Fok Chun Wing. 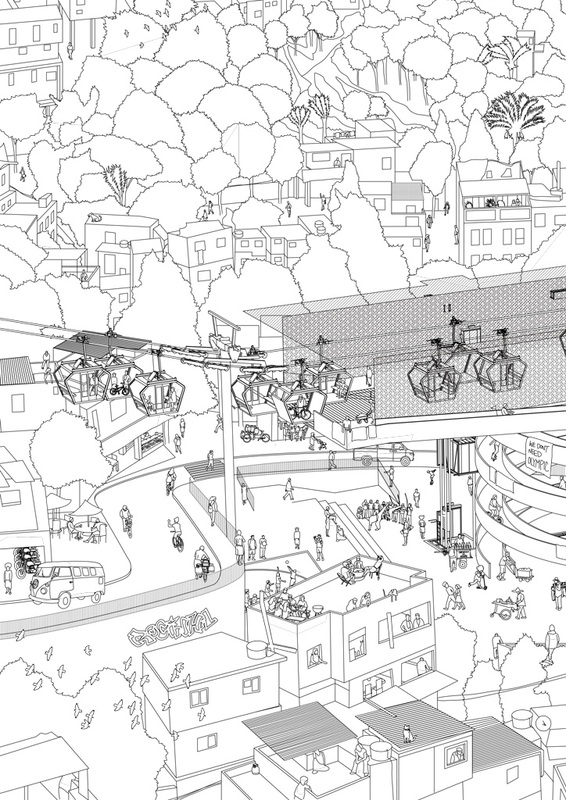 Proposal of a new cable car station and appropriation of public space. Project by Fok Chun Wing. Community participation in active waste management system. Project by Miriam Fernández Ruiz. Consideration of time, space and social actors involved in the proposed network of recycling centres and infrastructure. Project by Miriam Fernández Ruiz. Proposal of a waste management network that combines both top-down and bottom-up resources. Sketches that show the application of water pipes and possible appropriations of them. Project by Weijie Zong. Exploded axonometric of hybrid typologies. Left: Football field - Housing. Right: Alternative attractors. Project by Pablo Juica Yantén. It is crucial though not to lose sight of the forces within which these alternative approaches can operate both inside and outside educational environments. Socially engaged architecture and evidence-based information may ultimately be generated and appropriated by parallel discourses of optimization – the attainment of an efficient outcome – be it via adaptive social ecologies, or innovation networks at the service of the knowledge economy, or an implicit approval of the market’s ability to adapt continually to satisfy consumer needs. In his paper presented at the conference “Production Sites” 17 in 2015, Sean Weiss argues that “neoliberalism’s historical relationship with architecture has made the discipline justify its economic relevance, undergirding the field’s current emphasis on entrepreneurship, innovation, collaboration, pragmatism, and process as the bases for socially engaged practices.” 18 This means that alternative design models need to be weary of how architecture’s political agency is not subsumed by the economic motivations of clients, or the distributed interactions of regulatory codes, markets and infrastructures. The second difficulty with socially engaged projects is the fact that they might concern localized interventions and sidestep more systemic problems, social, political, and economic situations. We propose that in order to channel the transformative potential of architecture and reclaim its scope as a social discipline we need to move away from the autonomous-contingent question and theorise its relationship with the social, the political and economic processes of context. Combining theoretical, analytical and design research, we do not propose an overarching theory but rather a theoretical and practical provocation based on the following four propositions. First, architecture is about things entering into relationships with other things, which our minds grasp and creatively translate, rather than hierarchical separations into discovering patterns based on analysis or research, and freely creating patterns based on design. Third, at the level of design practice, this model requires negotiations between diverse types of agencies, from architects, users, stakeholders and social groups to socio-spatial infrastructures. Compared with the Albertian model of authorial centralization, this model has less control over production, but gains in reclaiming architectural agency through collaboration and interaction. Finally, we argue that architectural pedagogy needs revised theories and tools preparing students for the “authored” and the “bespoke” as well as for collaborative authorships, systemic design environments, emerging technologies and rapidly changing contexts. Fall ACSA Conference, organised by Roger Hubeli and Julie Larsen, Syracuse University, School of Arcihtecture, October 2015. Bill Hillier, Specifically Architectural Knowledge, unpublished lecture, Spatial Design, Architecture, Cities MSci Course, The Bartlett School of Architecture, University College London, 2015. Mark Gelernter, Sources of Architectural Form: A Critical History of Western Design Theory, (Manchester, UK: Manchester University Press, 1994): 18. Mario Carpo, The Alphabet and the Algorithm, (Cambridge MA, USA: The MIT Press, 2011). Rem Koolhaas, Delirious New York: A retroactive Manifesto for Manhattan, (Oxford, UK: Oxford University Press 1978). Justin McGuirk, Radical Cities, (London and New York: Verso, 2014): 14. We use "space syntax", a theory and a method for describing buildings and cities and relating them to the patterns of movement, use socio-economic activity and movement. Bill Hillier and Julienne Hanson, The Social Logic of Space, (Cambridge, UK: Cambridge University Press, 1984); doi: 10.1017/CBO9780511597237 and Bill Hillier, Space is the Machine: A Configurational Theory of Architecture, (Cambridge, UK: Cambridge University Press, 1996). Sophia Psarra, "Beyond Analytical Knowledge – intersections of generation and explanation," Istanbul Technical University's ITU Journal of Faculty of Architecture, A/Z. 2014, also, Sophia Psarra, "Beyond Analytical Knowledge – intersections of generation and explanation," (The International Space Syntax Symposium IX, Sejong University, Seoul, 2013), Korea, http://www.sss9.or.kr/paperpdf/saat/SSS9_2013_REF065_P.pdf. John Peponis, Χωρογραφίες: Ο Αρχιτεκτονικός Σχηματισμός του Νοήματος, (Athens, Gr. : Alexandria Press, 1997, in Greek). Bill Hillier, Space is the Machine: A configurational theory of architecture, cit., (Cambridge, UK: Cambridge University Press, 1996). Sophia Psarra, Fani Kostourou, Kimon Krenz, (eds). E-merging Design Research: Rio@Rio, London: The Bartlett School of Architecture Publications, 2015. In the context of the E-Merging Design Research module in the Spatial Design, Architecture Cities (SDAC) MSc course, Bartlett School of Architecture, UCL, (January-March 2015). A conference hosted by Sophia Psarra and Sandra Löschke (University of Sydney) at The Bartlett UCL, 29-30 July 2015. Sean Weiss, "Architecture: Between Social Engagement and Neoliberalism," in Production Sites, conference proceedings, Sophia Psarra and Sandra Löschke (eds), London: Bartlett School of Architecture Publications, 2015. Fani Kostourou is an architect and urban designer with degrees from the National Technical University of Athens, the ETH Zürich and the University College London. Currently she is an EPSRC funded doctoral student and a teaching assistant at the Bartlett School of Architecture (UCL). 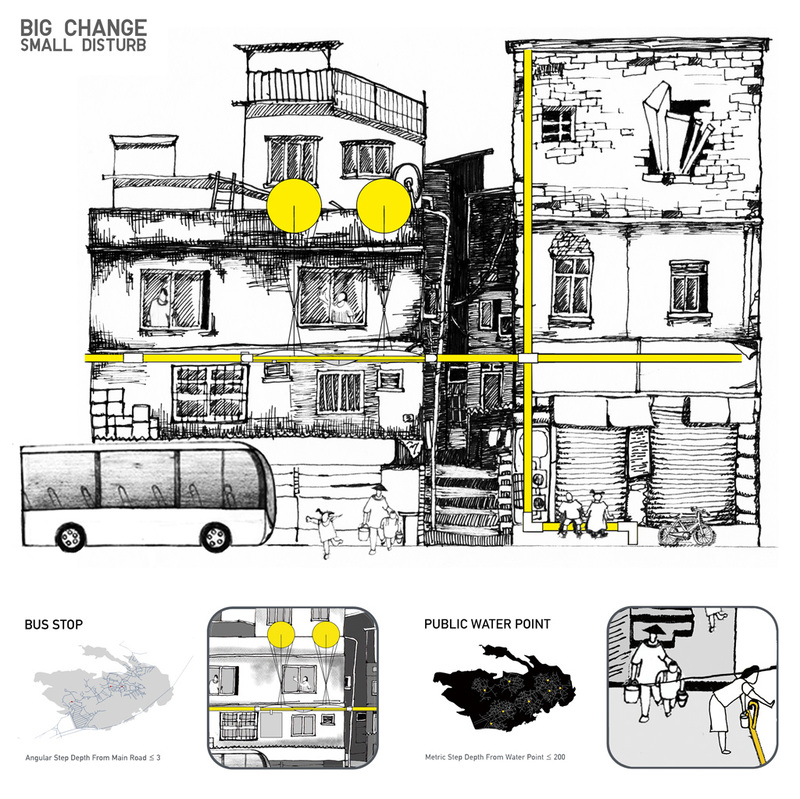 Recently her work has been published in Minha Casa, Nossa Cidade: Innovating Mass Housing for Social Change in Brazil (Ruby Press 2014) and featured in group exhibitions at the MoMA New York, Columbia GSAPP’s Studio-X Rio, Museu de Arte do Rio and X São Paulo Architecture Biennale among others. Kimon Krenz is an architect and urban designer with degrees from the Bochum University of Applied Sciences and the University College London, he is currently undertaking a PhD at the Bartlett School of Architecture, UCL. He holds grants from The German National Academic Foundation, The German Academic Exchange Service (DAAD) and the EPSRC. As well as working as a course coordinator and teaching assistant for the MSc Spatial Design: Architecture & Cities (SDAC), Kimon is an architect and consultant for the architectural practice Archwerk Generalplaner KG, Bochum.